This beautifully appointed 4-5 bedroom, 3. 1 bath custom-built home is situated on a part-wooded 3. 84 acre property, offering 3 levels of finished living space, 3 fireplaces & numerous venues for entertaining, both indoors & outdoors! The property boasts upper & lower patios, a comfortable screened porch, heated salt water pool, & hot tub. A double front door entry w/arched design leads to the center foyer, w/turned staircase & wrought iron spindles, & flanked by a home office & custom built-ins, & an inviting living room with marble fireplace. Behind is a gracious dining room w/french doors to the outside upper terrace equipped w/a grill! The stunning chef's kitchen & breakfast area has french doors to the terrace beyond. The kitchen is outfitted w/antiqued light glazed cabinetry, granite counters & bar sink, sitting bar w/"grothouse" cherry top, & large pantry; quality appliances incl. A subzero refrigerator w/ freezer drawers, 2 dishwashers (miele & bosch),full-sized wine cooler, wolf 5-burner gas cook top, stainless double ovens, built-in microwave & deep porcelain farm sink. The step-down great room w/cathedral ceiling showcases a cast limestone fireplace, b/in cabinetry & french doors to the outside. A large powder room w/specialty vanity & full laundry w/deep stainless sink & whirlpool washer & dryer, each are each privately tucked away. Upstairs, the luxurious main bedroom suite is outfitted w/custom carpeting, a sitting/study area, & plantation shutters. 2 large walk-in closets have closet systems; steps lead to the en-suite bath, w/two vanities w/onyx counters, jetted tub, & oversized steam shower. Two nicely sized corner bedrooms, one w/a fireplace, & a multi-use spare room (nursery,craft,yoga,bedroom) share a spacious hallway bath w/tub, w/linen closet & secondary laundry w/bosch stack washer/dryer! The lower level boasts a large media/game room w/custom carpeting, and access to the welcoming screened porch. Also, a lower level bedroom offers a true daylight experience, w/a full bath nearby-a bath for the bedroom and a changing room for the pool. An attached 2-car garage is accessible through the lower level foyer, along with a mechanical room. Across the driveway, there is a 2-car detached garage with full finished 2nd floor with skylights, wood floors, ceiling fan and tv- ready for use as a home office or gym! Special features incl. Propane heat, central vac, central security, lawn irrigation, electric gutter heating unit on upper terrace,a back-up generator, professional landscaping, two dishwashers, two laundries, & quality and pride of ownership throughout! 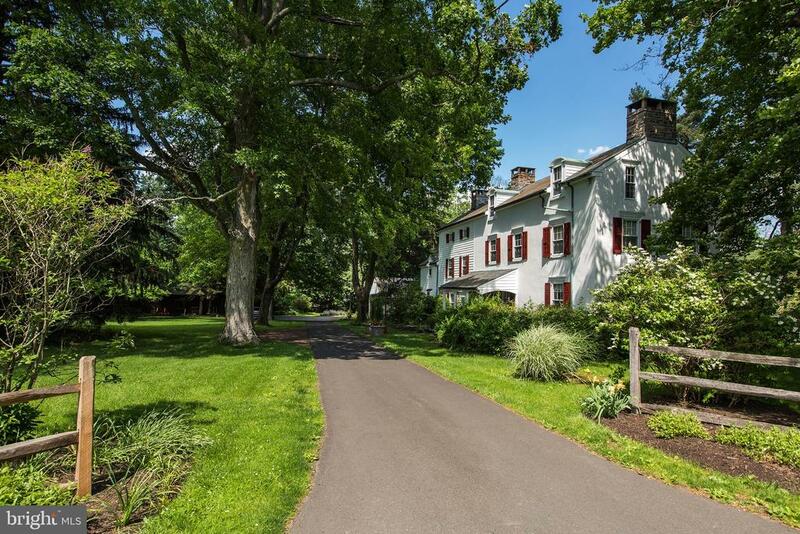 A modern bucks county farmhouse surrounded by eight protected acres pleasantly perched just outside the borough of new hope in idyllic cedar glen. The gated entrance greets visitors who will no doubt be charmed by the distinctive elegance of this historic home which roots date back to the 1840's. As one would expect the homes graceful exterior, classic details and rich hardwood floors echo a rich history. The current owners spared no expense in expanding and updating the property listed on the bucks county historic registry. Enter via the wraparound bluestone porch to a floor plan that is both spacious and comfortable, offering a grand dining room with a stone fireplace, fireside sitting area and built-in wood storage. The great room, with its own outside entrance, features a rumford stone walk-in fireplace, exposed beams, painted bead board walls and built-in vintage safe. A gorgeously appointed eat-in kitchen with granite counters, center-island, gray subway tile backsplash, soapstone farm sink and stainless appliances opens to a bright and airy sunroom with a propane vermont castings stove and sliding glass doors. A handsome library showcases built-in bookshelves and classic wood trim leads to a breezeway and the main level master suite which highlights french doors overlooking the bluestone patio, with a built-in fire magic grill and burners, hand pointed stone walls and a custom pergola. The main bedroom presents an en suite luxury master bathroom and custom designed walk-in closet. A convenient and private first floor office with built-in william draper desks and cabinetry adds storage and closet space. The laundry/mud room with its own side entrance and a large powder room with a built-in william draper dry sink and tile flooring complete the first floor. Two stairways lead to the second level with one bedroom featuring an en suite bathroom with a hand painted floor, built-in shelving and tiled walk-in shower. Two additional bedrooms share a gorgeous newly renovated bath w/marble tile, penny rounds, marble shower stall, hammered nickel sinks and original stone wall details. The basement offers finished/unfinished space and storage. An oversized 3+ car garage includes a workshop, storage and/or additional space for 2+ cars, water, electric, cable, and a second level that could be finished for studio or apartment, if desired. Exterior details include cedar/metal roofing, copper gutters and period lighting. Please see upgrades list for improvements. 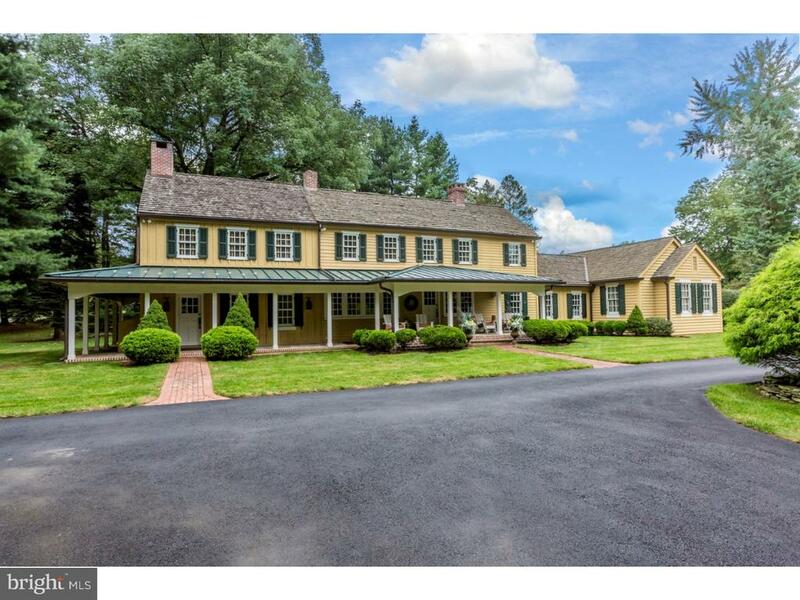 Centered on 5+ acres, this exceptional stucco over stone 4 bedroom, 5. 1 bath home, finished on 3 levels, has been consistently maintained and updated. Offered for the first time in 29 years, this much-loved property offers a pool, pool house, changing cabana w/dry cedar sauna w/indoor & outdoor showers, guest/pool house,tennis court,spring house/garden shed,oversized garage, large fenced paddock, privacy & charm galore! The gracious farmhouse boasts tall ceiling height, generous deep sill windows, random pine board floors,4 wood fireplaces, front & back staircases, all en-suite bedrooms, & a sensible floor plan that allows for modern day living! A center entrance hall leads to a formal living room (circa 1800's)w/ plaster fireplace & mercer tile accents, flanked by cushioned window seats. The original dining room (circa 1750's) is spacious,w/ full open beams & the original stone walk-in fireplace. Just outside is a fabulous flagstone screened porch w/large sitting area & separate step-down dining area-a total expansion of outdoor living space! Nearby is an updated eat-in kitchen w/pine cabinetry by william draper, back splash by charlie's tiles, wolf gas 4-burner cook top w/bonus wok burner, wolf wall oven and warming drawer, miele dw, 48" subzero refrigerator, deep farm sink, pantry, bar area w/bar sink, mini refrigerator,& wine cubbies. A built-in banquette is great for casual dining, w/ a sunny greenhouse window; also a convenient side entry mud room w/built-ins. A charming den with corner mercer tile fireplace is a cozy home office, outfitted w/a powder room. The 2nd floor main bedroom suite w/fireplace & delft tile accents offers a dressing closet area, and full bath w/ two pedestal sinks and corner tub w/shower head. But the heart of the home is a 2nd floor family room, formerly a bedroom, outfitted with built-ins and book cases & full bath- simply a great media/gathering space ? W/a laundry alcove nearby! A 2nd en-suite bedroom can be accessed by a back staircase; two addt'l en-suite bedrooms are on the 3rd floor; also a cedar closet. Outdoor living is fabulous with a pool & tennis court, pool house w/ flagstone floor, kitchenette & full bath,- perfect for a wonderful studio guest house. The over-sized garage allows for ample storage & work shop space. Also a tractor shed and wood shed. Zoned oil hot water heat, new septic system (2013), slate roof, and more. 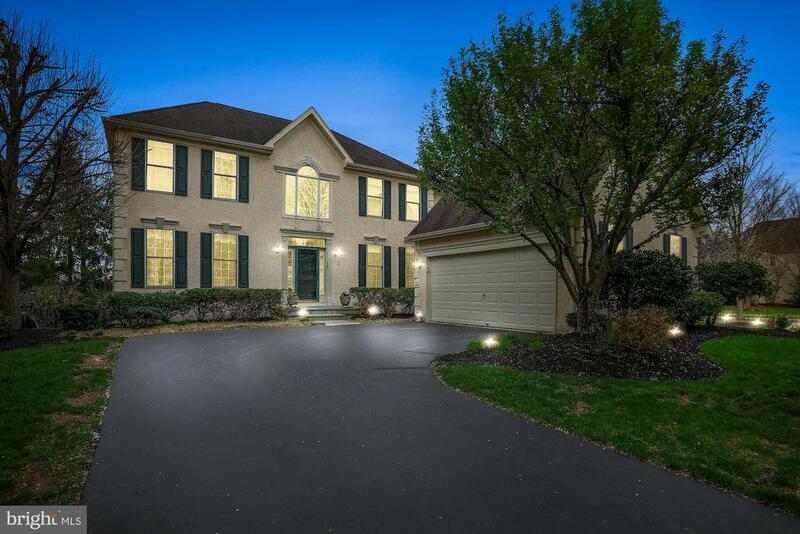 Just minutes from the rte 202 corridor & central bucks schools! A true gem! Welcome to this spectacular home, located in the orchards at jericho, a community of only 25 estate homes! The charm of the common area and the courtyard driveways make for a lovely setting. Enter into a sunlit 2 story foyer which welcomes you to a private first floor study and formal living/dining room complete with bay window, crown molding, chair rail and gleaming hardwood floors. The gourmet kitchen features newer stainless steel appliances, granite counter tops, stone backsplash, 42" cabinets, and an island with seating for 2. Large breakfast area with updated lighting, features sliding doors opening to cozy screened in porch. The perfect place to enjoy your morning coffee! Kitchen and breakfast area are open to spacious step down family room. A gas fireplace and large windows complete this family gathering place. Powder room is nicely appointed on main level next to large mudroom/laundry with garage entry. Upstairs you will find 4 bedrooms with tremendous closet space. The master bedroom features vaulted ceiling, spacious sitting room, 2 walk in closets and hardwood throughout. The master bath is complete with double vanity, stall shower and jacuzzi tub. Hardwood floors throughout the upstairs are a spectacular addition! The hall bath is perfect to share with double vanity, large linen closet and tub/shower. Basement is fully finished for entertaining and is equipped with optimal storage. The heating and a/c mechanicals have recently been replaced with high energy efficient ones. This home is move-in-ready. Conveniently located for commuting to nj, nyc, and philadelphia and nestled between new hope and yardley the orchards at jerico is close to parks, hiking and biking trails, golfing, dining and shopping. Welcome home! Build the home of your dreams here. Come see this gorgeous corner lot with a great location on wismer and ferry with 6. 53 acres of open area and woods. You can bring your horses, this property has room for a small horse barn. There is a small shed/barn already included. Septic and well are installed since there is a modular home on the property. Just up the road from carversville and close to new hope and doylestown. It is minutes to the delaware river with all that area has to offer. Dining, recreation, walking/bicycle trails and much more. Plus central bucks sd, what are you waiting for, come see this great lot today. Perc approved for 4 to 5 bedroom house.